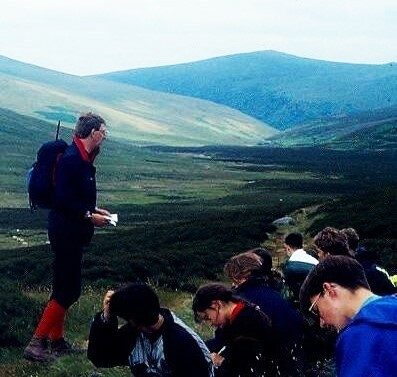 ABOVE: Year 10s (then '4th Year') undertaking a Dartmoor hill trek as part of a Geography Fieldcourse in about 1982. BELOW: The Asheldham Centre. The youth in the photograph of the Centre (below) are Explorer Scouts on a weekend residential course with Barry Howard. ABOVE: A quiet lunch stop at Lónið, Gigjokull, on an Iceland exploration with a school group, using 4x4s to traverse 30kms of wild rivers and challenging terrain to get to our mountain hut for the night. This view does not exist anymore due to the eruption of the volcano under the Eyjafjalljokull ice cap in 2010. The terrain has been completely changed at the point where the photo was taken. BELOW: BJH takes five on a route through the Avon Valley in South Devon near Loddiswell. 1983. My mission is to introduce, instruct, and initiate intrinsically motivated learning about the outdoors - for each person to find and explore the thing that provides the greatest fascination - and gives them the greatest 'buzz' about the outdoors. That may be rock climbing, botany, sailing, mountaineering, survival skills, geomorphology, arboriculture and forestry, hydrology, skiing, camping, canoeing, meteorology......the list is huge. I get requests every month (sometimes every week) asking how can a person get involved in instructing in the outdoors. Apart from telling them that the first quality they need is the capacity for hard work, they've got to have a repertoire. People give themselves all sorts of glorious labels to do with the outdoors - and cannot instruct more than one or two things...often for no more than half a day. Why? Because they've not learnt - they've not sat down and quite simply learnt over scores of hours, scores of weeks, and years, their craft. "I've watched you - I can do that!" How many times have I been met by those words?! All I've said is "Go on then." And they go away and buy all the equipment and have no idea how to develop a theme, a course, or a subject, and set themselves up as experts, ultimately to crash and burn. "Once you've got a passion - a subject, a theme, an interest, a skill, then work at it - this means putting in the hours - and become the best there is. But remember, you've got to 'want it' like a drowning man needs air. ......Then, and only then, come back to me." Working, instructing, and learning outdoors is my 'core' - my raison d'etre, it's in my bones. I don't run my business working outdoors because I have to - or because I like it (I do of course) - but because I can't help but interpret, guide, explore, and journey. It's what I've done since the early '70s. It's what I do now - every day. I can trace my family tree back eleven generations to the early 16th century, and almost every male in the line has a 'profession' in the outdoors: at one end of the scale poachers - on an industrial scale - in the early 1600s, a royalist cavalier officer in the Civil War, and my great-great-great grandfather was a game-keeper on the Rossway Estate, my great-uncle a coachman, my grandfather a farmer, - all the 'greats' in fact (including my father) have worked outdoors - full time - in rural areas. Thus I'm just one in the line. It's a generational thing. So there's no hardship for me in having to interpret the weather - and forecast - whilst on a windswept hillside in Galloway, dealing with an accident, navigate across featureless terrain, at night, maybe with clients who have overstretched themselves, or when we meet members of the public totally inappropriately dressed who need rescuing - from themselves - as well as the 40mph horizontal blizzard on Dartmoor one winter when we had to intervene in some townies' gentle stroll, lest they kill themselves. ......I can bring over 40 years of experience to your organisation - working with young - and not-so-young clients, across the UK, setting up projects as diverse as mountaincraft, environmental studies in local woodland, to a navigation exercise in the Cairngorms, cold weather survival in Arctic Norway, to day-courses in bushcraft, or medieval history and archaeological research, and exploration for school pupils of any age, and guiding across the Southern Uplands or Assynt....or any wilderness you care to name. Where did it start for me? In 1958 I clearly remember going on nature walks with my class and our teacher, across to the saltmarshes and creeks of south Essex, collecting all sorts of flotsam to stick to a piece of card or draw. We had to 'find our own way' with the teacher keeping a close eye upon us. So is this the age - I was 6 - in which respect, enjoyment, and love for the outdoors starts? Maybe. Certainly there was a 'Wow!' factor there, which left me straining at the leash to get back out to that open countryside as quickly as I could - not being able to wait a week for the next practical lesson looking at 'The Nature'. And I reckon it's that which needs nurturing in the young people we teach and instruct - the curiosity, the 'Wow!' and the freedom to go and explore. The fact that I lived in a road surrounded by dense hawthorn thickets - which I of course explored - and was to land up with a charismatic geography teacher who taught me more in 5 years than most people have in a lifetime, meant that I didn't stand a chance.....I was smitten and by the time I was in my late teens was instructing elements of the outdoors - how to navigate one's way around and through it, how to survive in it (Ray Mears wasn't even at Infants' School then), and how to work with Nature - and not try to 'take it on'. 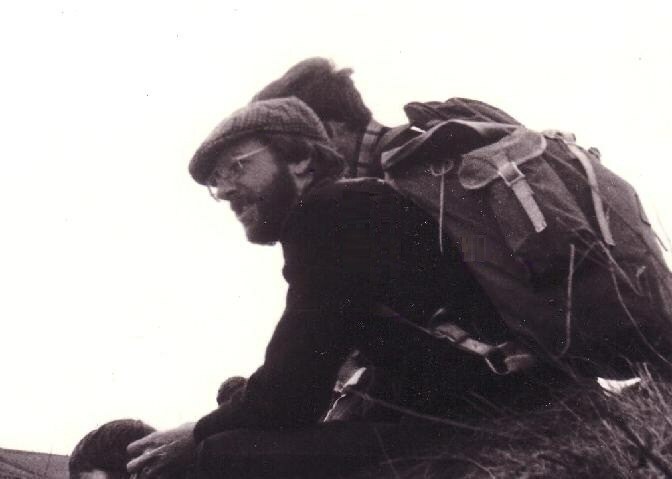 I started formally instructing outdoor education (as it's called now) in April 1972, guiding across Dartmoor, Snowdonia, and Arran. However the genesis of my outdoor life was 9th April 1968 in Cwm Idwal. I knew then - and it came as a 'blinding flash' - that this was what I wanted to do - work in these landscapes, interpret them, teach about them, and know as much as I could about them. 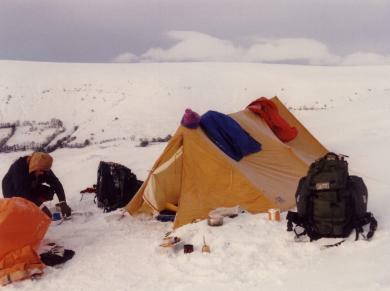 I became a cleptomaniac for information, worked 18hrs a day learning, experimenting, planning expeds., making mistakes, getting out in all weathers - and in those days hitch-hiking the length and breadth of the country; I talked to those that know, read colossal amounts about the outdoors: history, techniques, risk, equipment, and routes, and risked 'A' levels and degree to put my ideas into operation ultimately having some great successes and one or two ignominious - and high-profile - failures. But what a platform to build upon. I now push the boundaries of outdoor learning - constantly - ensuring clients, whether youth or adult, are aware of the capability of the outdoors itself to mould and alter peoples' behaviour and perceptions. I am often just the facilitator with weather, terrain, view, distance all playing their special part. It's been a fantastic journey so far. ABOVE: Winter Mountaineering Skills Course with Year 11s in Lifjell Norway, here 1250m up.